1. Chris Paul -- Last year at this point Clippers were 19-31. They add Chris Pual, they're 29-21. You can't deny the facts, he's more valuable to the Clippers than any player on any other team. 2. Kevin Love -- Putting his whole team on his back, keeping his team in contention. Without Love T-Wolves are one of NBA's worst teams. 3. LeBron James -- Tough call between KD and LBJ, went with LeBron. The Heat's various injuries made LeBron the pick here, because without LeBron the Heat would have actually really struggled. 4. Kevin Durant -- There are nights when he's overshadowed by Westbrook, and his team would win without him more often than the Heat would win without LeBron. Kevin Love is putting up ridiculous numbers. With his 51 point game, and his 40 point 19 rebound game, he's having a ridiculously good statistical season. If LeBron's PER can remain the same he will have the best PER ever. That's incredible. He's only behind Love because of Love's amazing rebounding rate that goes with his scoring. Kevin Durant is the best scorer in the NBA, and he's always going to put up impressive stats. This year he's scored less than the two previous years though. With Chris Paul the stats don't show the affect he has on the game being played. While his stats are impressive, they're not nearly as impressive as the stats of the players above. Paul's affect on the game comes with his speed and leadership along with the scoring and passing which he of course also does well. 1. Kevin Durant -- OKC is living up to expectations with the second best record in the NBA, and Durant is a big reason why. 2. 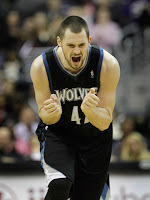 Kevin Love -- With Rubio out for the season the T-Wolves season is fully dependent on Love. He's embraced this, and has gotten his team of NBA draft busts into playoff contention. 3. Chris Paul -- The Clippers were expected to compete for the division and make the playoffs. That's been exactly what has happened, and they are currently leading their division. 4. LeBron James -- It's pretty crazy for a team to be second place in the confrence and be underachieving... but that's the case with the Heat. After looking at the three things that are considered when deciding who's MVP, I've decided Kevin Love should be the 2011-12 NBA MVP. He has the best stats out of the four candidates, and has carried his team by himself like none of the other candidates. Love was the best player in the NBA in March, when he scored more than 35 points 5 times, including a 51 point game and a 40 point 19 rebound game. 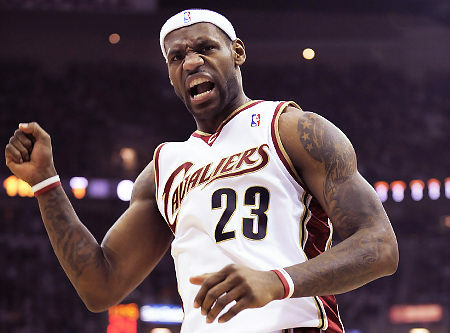 He's been dominating every team he faces, and the teams play fully relies on him. If Love were not on the Wolves they'd be one of the worst NBA teams instead of a playoff contender. 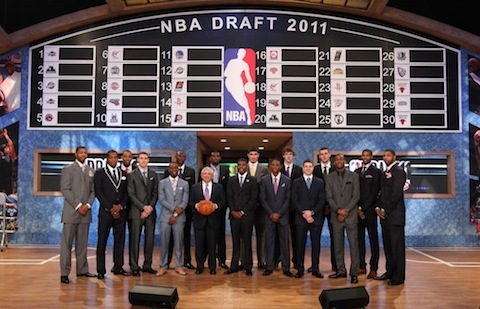 The 2011 NBA has turned out to be a surprisingly good one. There wasn't a superstar in the draft, a LeBron James or Dwight Howard, but there were a lot of good players who got drafted last year. Most of the first round draft picks have gotten consistent minutes and have had solid production this season, and some second round picks have had a huge impact as well. 15 of the first 20 picks have gotten more than 5 starts this season, and 4 second round picks have gotten starts. Looking back there were some very good picks and some very bad picks in that draft. Here's how the draft would have gone if it could be re-done right now. Explanation: Kyrie Irving has been the best player to come out of this draft. His rookie numbers have been comparable to Derrick Rose's rookie stats, which shows just how good he has been. He's turned the worst team in the NBA into a playoff contender. Explanation: Derrick Williams would be the T-Wolves would be the second best option here, but the best pick would be Kenneth Faried. The undersized power forward has been one of the most effective big men all season. Every time he steps on the court he gives 100%, and it has shown in his production. He has been improving all season, and should keep improving in the future. 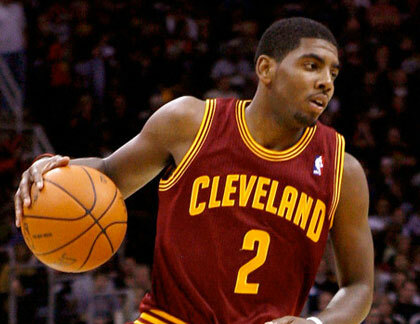 He has begun to consistently get over 10 points and 5 rebounds, while playing great defense. On a Minnesota team with a frontcourt of Pekovic and Love, who are both "below the rim" players, Kenneth Faried with his above the rim style would be very valuable. Also Derrick Williams was better at PF than at SF, so the T-Wolves wouldn't be losing significant production at SF. Explanation: Although Derrick Williams is better at PF, he is still an option at SF. He would fill a need at SF for the Jazz, and would add huge depth the the already stacked frontcourt of Jefferson Millsap and Favors. Kanter is getting very little playing time, and has not lived up to the expectations the Jazz had for him when they picked him 3rd overall. Derrick Williams would provide help at the SF position along with adding depth at PF. Explanation: Kawhi Leonard is a coaches dream. He rebounds, scores, is a good passer, plays great defense. He isn't "great" at any one aspect of basketball, but instead he's good at all of them. His play in college with San Diego State was very similar to his play in the NBA, but scouts always thought he couldn't be as effective in the NBA. They were wrong. Leonard is a very solid consistent player, who will give good minutes to whatever team he plays for. The only reason he fell to 4th pick is that his upside isn't as high as the players ahead of him. With Tristan Thomson, much like Kanter he hasn't lived up to the expectations, and hasn't quite learned how to score consistently on NBA big men. Explanation: The Raptors need a real franchise center to compete for a playoff spot in the east. They have that player in Valencunas. 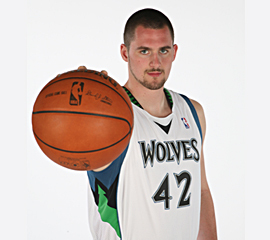 He's been playing on the Lietuvos Rytas Team and has been tearing up the Lithuanian League. Valencunas will be joining the Raptors in the 2012-2013 season, when we will find out whether this pick was genius or very dumb. Explanation: Washington had an opportunity to use their #6 pick for a very good player that would help the Wizards get to the playoffs. That is absolutely not what happened. Jan Vesely, although loaded with potential, has not been able to put his skill together and consistently play well for the Wizards. The Wizards needed a player who would consistently play well and create scoring opportunities. Jan Vesely doesn't do these things, but Isaiah Thomas does. The very last pick of the 2011 draft has proven that 29 teams made a mistake by not picking him. He has been the creator of offense for the Sacramento Kings this year, and has been a huge surprise. His speed and consistent jumper makes him very hard to cover. This pick would also make sense because there is a lack of depth at SG after Nick Young was traded away, and Isaiah Thomas would quickly become a reliable shooter guard option (he's a point guard but also plays shooting guard). Explanation: In the 2011 draft Kemba Walker was picked by Charlotte with teh 9th pick, but if the draf were to happen again the pistons would surely pick Kemba. That's why the Bobcats would pick him here, instead of waitig for their next pick. Kemba has struggled with his shooting this season, but has still managed to get 12.1 ppg. He is the lone bright spot on one of the worst teams in NBA history, the Charlotte Bobcats. Kemba's U'conn team could have beaten the Bobcats. It should be presumed that when Kemba does get other good players around him in Charlotte he will become a much better player. Explanation: Brandon Knight was supposed to be the next great Kentucky point guard to become an NBA star, following in John Wall's footpaths. That hasn't happened. Although he hasn't been awful, he hasn't been as good as expected, and has been outplayed by Rodney Stuckey. With Stuckey at point guard that leaves Ben Gordon and Teyshaun Prince at shooting guard and small forward. For a team rebuilding, those are not the guys you want playing most of your minutes. The Pistons are looking for a shooting guard, and the best one in the draft is MarShon Brooks. In college he was much like Jimmer Fredette, shooting from wherever and putting up insane numbers. The difference is Brooks's success has also happened in the NBA. He's proved if healthy he can be a consistent NBA scorer. Explanation: Kemba was picked by the Bobcats with the 7th pick, so this pick was between Bismack Biyombo and Tristan Thomson. Even with as good as Biyombo has been for the Cavs, Thomson would be the obvious pick here. Thomson is a good defender and rebounder, and his offensive skill while raw is improving. He's much better offensively than Biyombo, and has a more promising future than Biyombo does, even with Bismacks blocking ability. Explanation: Jimmer is a good three point shooter, and that's about as far as his skill set goes. He can't defend, struggles to drive and tries to make too great a pass. Picking Jimmer with the tenth pick was a HUGE mistake for the Kings. The Kings are the worst defensive team in the NBA, and what they really need instead of a shooter is a guard who's great at defense. With Shumpert they'd get one of the leagues best on ball defenders, and a guy who can play point guard, which is something the Kings will need with Isaiah Thomas being picked by Washington. The greatest part of Jeremy Lin's story was that it was completely unexpected. Lin came seemingly out of nowhere to quickly become one of the biggest sports stars in the world . No one saw it coming. Coaches, analysts, owners, reporters, writers, no one. Except for Casey Mack. From August of 2010 to March of 2011 Casey Mack was a writer for the website dimemag.com. The 8th of the 35 articles that Casey wrote for dimemag.com was a historic one. 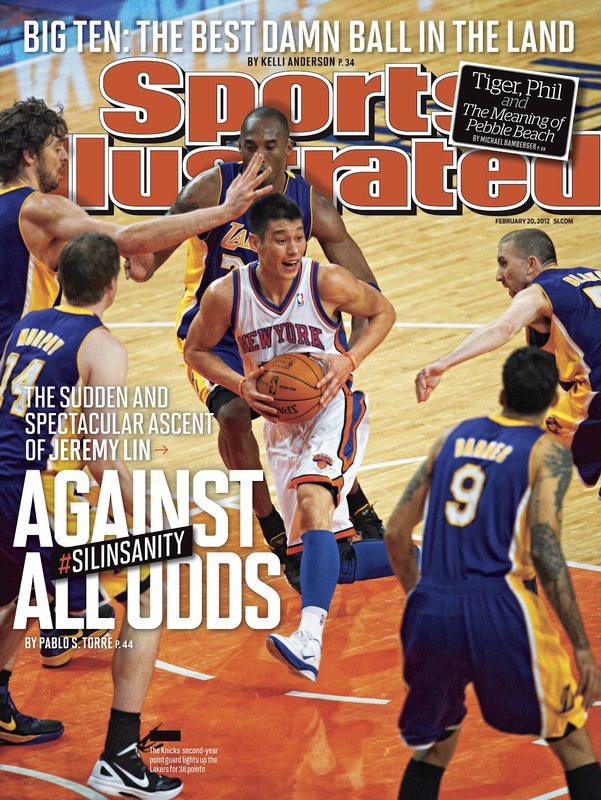 It was proof that linsanity was in fact predicted. In Casey's article, "The Warriors Have The Next Steve Nash On Their Roster", he talked about how Lin could turn out to be a very special player. He wrote this article before Lin had played an NBA game (written in September 2010), and much of what Mack predicted has been remarkably accurate. Here are the main predictions from the article, and how they've really turned out. Prediction: "Each [Nash and Lin] is a blur in the open court, with great vision and dependable pull-up jumpers.".... "By always keeping his options open with the ball in play, Nash creates extra time and space for himself and for his teammates to get open and get buckets. I think that knack for keeping his dribble is what will translate into Nash-type success for Lin more than anything." The Truth: That prediction could not have been more correct. All the comparisons that were made between Nash and Lin's game were because they both have amazing quickness, vision, a dependable pull-up jumpers and the ability keeping his dribble alive. Those things are what have made Lin such a great player. Lin's ability to keep his dribble alive gives his teammates time to get wide open and get easy buckets has also been a huge part of his game, just as Casey suggested it would be. Prediction: "If Lin can keep his handle up to par and keep that chip on his shoulder until the right opportunity comes along, the double-doubles are sure to come for this Asian-American sensation." The Truth: The right opportunity wasn't the Warriors, wasn't the Rockets, it was the Knicks. Once again the prediction was correct. Prediction: "Just like Nash, Lin didn't hone his skills at a college basketball powerhouse. Just like Nash, he is a minority in the game who has had to prove himself at every step in the process and plays with a perpetual underdog chip on his shoulder." The Truth: Everything mentioned, his Harvard education and Asian background have been the reason he's been overlooked, and has been the reason he's been able to fight through adversity and find success. 1. LeBron James (SF) -- Some question how clutch he is, some question his competitiveness, but no one questions that LeBron is the best overall player in the NBA. He's more valuable to a team than anyone else. 2. Dwight Howard (C) -- Dwight Howard single handedly makes his team one of the best defensive teams in the NBA. He also has eight 20 point 20 rebound games this season. He's tough to turn down. 3. 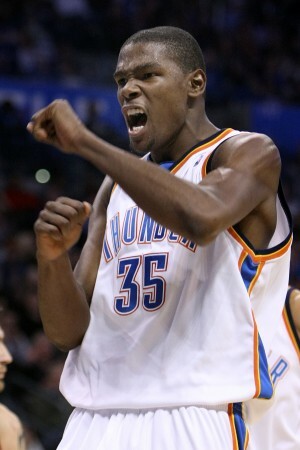 Kevin Durant (SF) -- Kevin Durant is the best scorer in the NBA. He's won the scoring title the last two years, and is just 23. The only reason he's third and not first in this draft is that the two players above him are much better defenders than he is. 5. 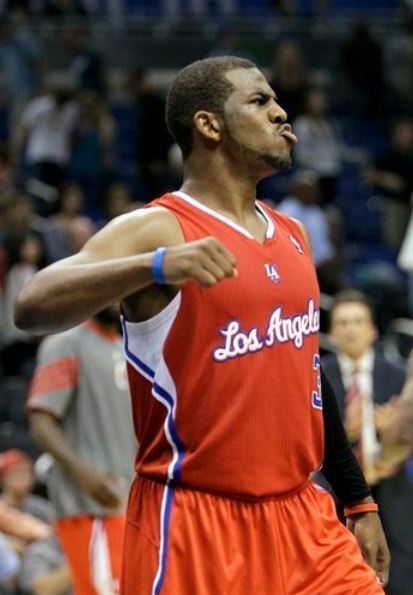 Chris Paul (PG) -- As mentioned Chris Paul is arguably the best point guard in the NBA right now. He's behind Rose though because he's three years older and isn't going to improve as much as Rose will in the future. Paul does have a huge impact on a team though, a perfect example is the LA Clippers. 6. Blake Griffin (PF) -- Blake Griffin's upside is enormous. His offensive game is currently very raw, yet he still averages 21.2 ppg this year. When Griffin learns learns how some good post moves and gets his jumper more consistent, NBA watch out. Also no one sells tickets quite like Blake Griffin which is very important to some struggling franchises. 7. Dwayne Wade (SG) -- Wade falls back to no. 7 because of age and injuries. He's been struggling with a number of injuries this season, which has resulted in inconsistent play. Also Wade is 7 years older than Griffin Rose and Durant, so why pick Wade over those guys? 8. Kobe Bryant (SG) -- Sadly the great Kobe Bryant is getting old (well... basketball old). At 33 no one know how many more great seasons he's going to have. He may be getting old, but it doesn't seem to be affecting his scoring. He's a great scorer and shooter, and will likely be able to put up the amazing numbers he's currently putting up for at least the next 3 years. Kobe is a great leader, and when crunch time comes there's no one in the NBA who's I'd rather have. 9. Russel Westbrook (PG) -- Russel Westbrook is insanely athletic, and can do things at the point guard position that no one else can. The downside is that he's often criticized for shooting too much and not passing to the other star his team, Kevin Durant. If Westbrook is on a team that fits his playing style, he could become a point guard very similar to Derrick Rose. 10. John Wall (PG) -- Similar to Blake Griffin, John Wall has incredible upside. A change of scenery and a new system could turn this much hyped no.1 overall pick into the best point guard in the NBA. In the Air Canada Center in Toronto the least talked about, most forgotten, and most underrated team in the NBA play about twice each week. That team of course is the The Toronto Raptors. On that forgotten team are 12 players who all deserve more media attention and most of them are very underrated. 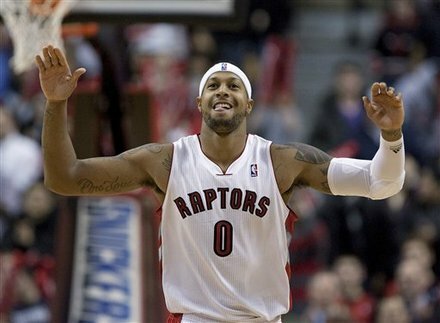 The most underrated player (by far), on the most underrated team is James Johnson. The 6 ft 9 starting SF for the Raptors has been having an amazing season. Johnson is underrated by fans, writers, reporters, virtually everyone outside of Toronto. The players know how good Johnson is though. He is as strong defensively at his position as anyone else in the NBA. LeBron, Igoudala, Gay and Durant are generally looked at as the best small forward defenders, but James Johnson is equal to all of them, if not better. He defends the opponents' best scorers, and defends them just as well as the names I previously listed. Don't believe me? Look at the stats below. As the charts show James Johnson is one of the best defenders in the NBA even though outside of Toronto he's virtually unknown. He definitely deserves to be in the Defensive Player of the Year discussions, but given how underrated he is, he may not. James Johnson deserves way more credit than he receives for his defense, and he's improving on the offensive side as well. At just 5'6 Aquille Carr is tearing up high school basketball. In his freshman season with Patterson High School he averaged 25 points, 8 assists and 5.3 steals per game. That was good enough to get him freshman of the year honors. His best game came against Lake Clifton when he was being guarded by current Memphis Grizzlies bench player Josh Selby. Carr scored 39 points along with 19 assists while being defended by the 7 inches taller Selby. In his sophomore season he lead Patterson High School to a 25-2 record and to the Class 4A state championship game. That season Carr had an incredible 57 point game against Forest Park, where he broke the school's 50 year record for most points in a game. In his junior year he just kept improving as he averaged 31.3 points, 5.6 assists and 4.5 steals per game. His senior year was very similar to his previous two, and it ended with leading his school to a Class 3A state championship. In that game Carr had 28 points, 8 assists, 6 steals and 3 rebounds. Carr's success is being noticed all around the world. CBS Sports called him "one of the most explosive scorers in the country". ESPN wrote that he's "one of the quickest and [most] explosive players in the country, regardless of class." Sports Illustrated wrote, "He has explosive speed, electric ball handling and court vision that could rival Steve Nash's." A 5'6 140 pound kid scoring 57 points in a game with a 48 inch vertical leap and the ability to dunk is certainly going to get peoples' attention. He was reportedly offered 26 scholarships at the start of his sophomore season. As well, after averaging 40 points a game with the U.S. junior team in the Junior International Tournament in Italy he was offered $750,000 to leave school and go play professionally for the Italian team Lottomatica Roma. He has decided he will graduate high school (this is his final year) and he has verbally commited to playing for Seton Hall next year. Here are some videos to show just how explosive and talented this young man is. The Knicks are hoping to surprise some people and make a deep run in the post season. There is just one thing standing in their way. His name is Amare Stoudemire. Amare was most at fault for the Knicks struggles earlier on this season, and the same problems will likely occur in the postseason. Since Mike Woodson's arrival Stoudmire has barely played because of his injury, and when he does return the Knicks are destined for trouble. Here's why. The low point of the season for the Knicks came after losing to the Bulls on March 12th. They were 18-24 which was an embarrassing record for a team of such talent. Two days after that loss D'antoni resigned, and since then the Knicks season has been revived. They're winning a lot more under Mike Woodson and are playing with more passion and effort than they were with D'antoni. Even with the success of the Knicks under Woodson, as I look back at the first 42 games of the Knicks season I realized the Knicks struggles were even more Stoudemire's than D'antoni's. Up to that point the Knicks had been a tale two teams. One team that is 10-23, and one that is 8-1. The 10-23 team is an unexcited and unenerergized group that is stagnant on offense and plays minimal defense. This is a team with chemistry problems and with guys that just don't play well together. This is a mix of egos, between Amare Stoudemire, Carmelo Anthony, Tyson Chandler, and even at times Jeremy Lin. The second team, the team that went 9-1, is a completely different story. This is a team that is very willing to share the ball, and that plays great team defense. This team features a lot of Jared Jeffries, Billy Walker, Steve Novak and Iman Shumpert, and even with the lack of star power these guys work great together. These guys are easily excited and show emotion after virtually every play. There was tons of blame going around about why the Knicks weren't able to play to their potential (which they're now doing). Some of the blame was on Carmelo Anthony for not passing enough and some was on D'antoni for poor coaching. Both of these men were at fault for the Knicks struggles, more D'antoni than Carmelo, which has been proved by the success the Knicks have had since D'antoni's resignation. 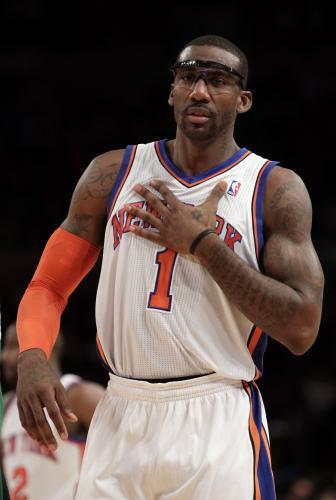 The real blame though should have been on Amare Stoudemire. This aging superstar has never been a fit in New York. He was the main reason for the stagnant offense which has cursed the Knicks all season. He's also liability on defense. Opponents intentionally target him as a guy to score on, which has been done successfully many times this year. The lack of defense and the stagnant offense he brings to the Knicks are the two things that have killed the Knicks all season. Since Stoudemire's recent injury the Knicks have looked like a new team, just like they seemingly do every time Stoudemire isn't playing. That's why the Knicks made a huge mistake not trading Amare at the trade deadline, and they should trade him in the off season. You may be asking; But who will become the team's power forward? Jared Jeffries. Jeffries is a very unselfish passer who plays unbelievable defense and always hustles. He's almost the very opposite of Stoudemire. You may also be asking; But you have no proof the team struggles because of Stoudemire!!? Wrong. The Knicks are 5-18 when Stoudemire shoots more than 12 times in a game, and 4-15 when Stoudemire plays more than 35 minutes. On the contrary when Jared Jeffries plays more than 20 minutes in a game the Knicks are 12-6. If the Knicks want to make a run in the postseason, they need to play Jared Jeffries and Steve Novak a lot more than Amare Stoudmire.